First Line: A perfect night for feijoada. Rusty Mason hasn't been home in over ten years, so no one is more surprised than his brother Peter when Rusty's body is found facedown in one of the cranberry bogs on Peter's farm. Rusty was persona non grata to Peter, so why on earth was he there? That's only one question of many that Detective Merry Folger of the Nantucket Police Department must answer in her very first murder investigation. And while she's trying to find a killer, she's going to have a lot of people looking over her shoulder and trying to second-guess her: an overprotective father who's also chief of police, a jealous co-worker, an old flame, various suspects... and even Merry herself. 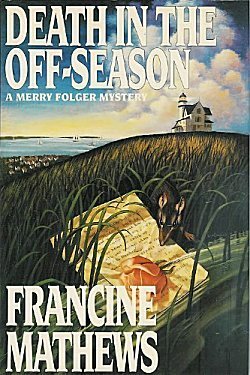 Francine Mathews writes excellent historical thrillers (Jack 1939, Too Bad to Die) that I always look forward to reading, so when a trusted source told me that she'd also written a police procedural series set on Nantucket Island, I knew I had to read at least one. After turning the last page on Death in the Off-Season, I know I'll be reading the rest of the series. What's to like? First off, there's the setting of Nantucket Island. Although I've always been curious about Nantucket, I'd never read a book set there, so I really enjoyed Mathews' descriptions of the landscape and the weather, as well as information on growing and harvesting cranberries. Since Merry Folger and her family have deep roots on the island, Mathews also includes a bit of Nantucket history and geneaology. None of this is done in a heavy-handed manner, and all of it combines to add a strong foundation as well as charm to the story. Something else to like about Death in the Off-Season is main character Meredith Abiah Folger. (How's that for a strong New England name?) She's smart, she's strong, and she certainly has good instincts. What holds her back is an overprotective father who also happens to be her boss. His desire to keep his daughter from harm not only makes Merry angry, it also causes her to hesitate, to doubt herself. Fortunately for her, Merry also has a wonderful grandfather who's loving, yet no-nonsense. He listens to her and gives her sound advice. (Now if he'd only set his son straight!) The only thing that appears to be wrong with Merry's grandfather is his tendency to turn their home into an episode of "Hoarders." Mathews' cast of characters is a very strong one-- not only Merry's family, but several townspeople and friends as well. In fact one of the townspeople on Merry's list of suspects may turn out to be of romantic interest in future books. Setting? Check! Characters? Check! So what about the story, the mystery, the whodunnit? I have one word for it: brilliant. 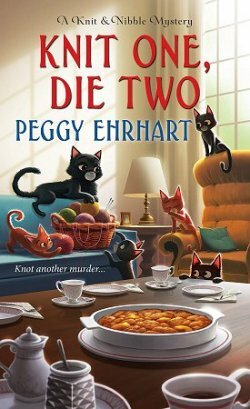 The plot weaves people and secrets together in such a way that I never saw the identity of the killer coming. Plot? Check! Now you understand why I want to read the rest of the books in this series, don't you? Oh, this does sound like a good read, Cathy! And the setting appeals to me too. Actually, that first sentence, with its mention of feijoada got me. I like reading about different communities, and the Portuguese influence in Rhode Island is definitely part of that. Yes, it is, and most people probably don't know about it. 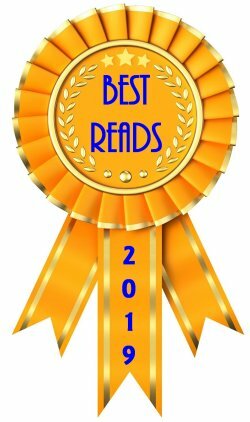 You have been having a good streak lately of finding books that you really enjoy. 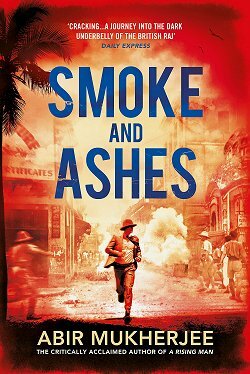 I am reading right now A Trace Of Smoke due to your recent review. I am really enjoying it. The time period and the Berlin location are quite interesting. 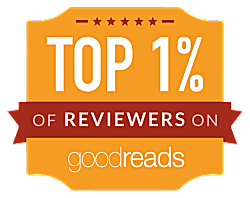 I am reading next The Chess Men and A Desperate Fortune due to your reviews. I did read the first two books in the Peter May trilogy. Thanks for your reviews. You're very welcome, Lynn. I *have* been having a good run of excellent reading lately. I'm hoping it won't end any time soon! I notice that you always have a e-book that you are currently reading and a physical book. How do you handle two books at one time? Do you alternate them? Get interested in one and finish it? From what I have read that you have written previously about various subjects, I think you might do something different each time as you like to read what you want at the time and don't follow a schedule. As I said, an inquiring mind wants to know as I have always wondered how you did it. I know others read more than one book at a time too. I read one book at a time. I do think if one was on the go and out of the house a lot, an e-book is easy to take along and one could have a physical book at home. The way I handle my two books at once differs depending on the time of year. During pool weather, I read physical books out at the pool, and the eBooks stay in the house or go with me when I'm off to appointments and such. I read a lot more physical books at this time. When it's not pool weather, it depends on which book is holding my interest more as to which I'll read. Also, I always read at least one chapter in bed-- my way of putting a wrap to the day-- and that bedtime reading is always the eBook. I've never had trouble keeping multiple plots and characters straight as I read, but I have to admit that I've actually slowed down as I've gotten older. I used to have 5-7 books going all at the same time with no ensuing confusion! Thanks! Now I don't have to wonder how you work it out. It makes sense how you do it. I think you are probably a pretty fast reader too. This time of year, it's not unusual for me to read a book a day, Lynn, which is why I post four reviews instead of three each week. Omigod, you just added to my absurd TBR list. This reviews makes this book sound irresistible. Is it a cozy though? Also, this cover is intriguing although it looks scary. I can't quite figure it out, only that it's frightening. No, I wouldn't call it a cozy, Kathy. It *is* more of a police procedural, but without graphic violence, bad language, and the like. And is A Desperate Fortune a cozy? I know it's historical, but it's also billed as a romance which sends me scurrying. It isn't a cozy either. I don't like romance, Kathy, and the romance was acceptable to me. For one thing, even thinking about a relationship was important to the main character who has Asperger's.